I had bought some anti-seasickness tablets before leaving Albany concerned that queasiness might affect my ability to work. Fortunately I never had to take one. On reflection I think the best antidote to that deathly feeling of seasickness might be staring down a viewfinder -- or at least concentrating on a focused task. As we pulled out of port I set about filming our departure and the sense of anticipation on board. In these protected waters I knew it might be my best opportunity for securing stable footage. But I was also aware of some apprehension among the crew that there was a journalist on board and I tried my best to go about my work as discreetly as possible. In time the crew turned out to be hugely supportive from charging batteries to securely stowing my equipment even to offering me ideas to garner unusual shots (eg from out on the bowsprit, the spar running forward from the bow). 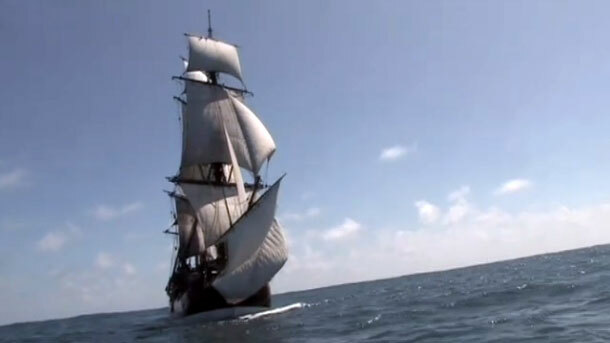 My highlight was filming the ship under full sail. The captain ordered the lowering of the rescue boat and I was generously given space on board to film the Endeavour from a distance. It was an astonishing hour: crouched in a little red boat bobbing up and down in the Southern Ocean focusing on this tall ship under full sail. Undoubtedly the toughest filming was during the storm. There were heavy seas, big winds and a wave-splashed deck -- and crew had to be harnessed to storm ropes as we moved around. It was difficult to capture the magnitude of the swell or the sound of the whipping wind but I hope I did the forceful weather some justice. Arriving in Port Lincoln we again had calm waters and a protected bay. This was my opportunity to conduct some interviews and there was no shortage of articulate crew nor interesting backdrops on deck. It had been a wonderful assignment to voyage across the Great Australian Bight. 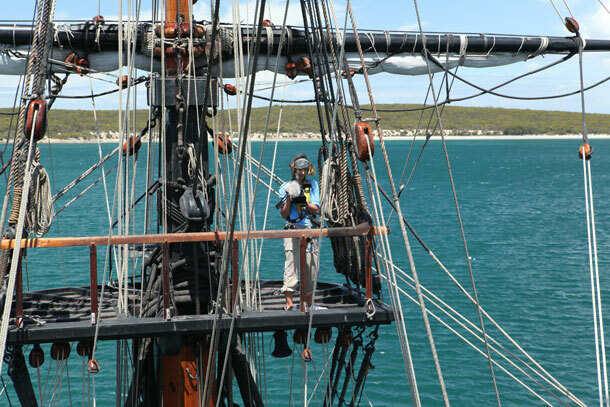 Greedily I only wish I had been assigned to cover the Endeavour’s entire circumnavigation of Australia.